About Ship Lane At first the ground was a part of the Thurrock Hotel and at first consisted of two pitches and dressing rooms in the main hotel building. Due to this set-up the club could only compete at Junior level. The playing area was turned around 90° to make one full pitch and dressing rooms were built so the football club could become a separate entity away from the Hotel. 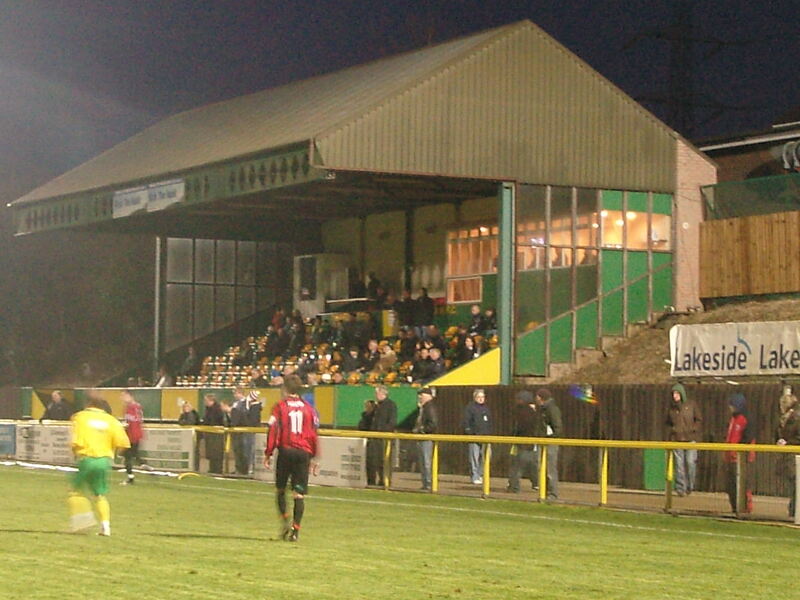 Floodlights were erected in January 1988 after planning permission was accepted from Thurrock Council to add these features as well as a grandstand. How to get to Ship Lane Potentially one of the easiest grounds in England to find. Exit M25 at junction 31. If coming from south (i.e via Blackwall Tunnel) then take 3rd exit into Ship Lane and ground is 50 yards on right. If you are coming from north on M25 then it is the 5th exit. Nearest station is Purfleet which is about a mile away. How to get a ticket for Ship Lane The ground never comes near to capacity for 99% of games played here. Even recent FA Cup games have been pay on the door and with an average attendance around 8% of the capacity you will not have an issue turning up a 2.55pm and getting in. £10 for Adults, £2 for Under 16’s and you can move from terrace to stand as you want. Our last visit – Thurrock 3 Lewes 1 – 28th December 2009 Every day nearly 250,000 cars pass by junction 30 of the M25 in deepest, darkest Essex. On many days, such as a Bank Holiday Monday like today the “Road to Hell” becomes the world’s biggest car park as traffic heading for the retail cathedrals of Lakeside and Bluewater collide in coastal Essex. For those travelling anti-clockwise you may have stolen a glance to your left as you pass over the junction and seen a few tall, thin floodlights poking up in the air. Very few people ever have a chance to make a detour and find out this mysterious venue, passing it in the blink of the eye. Well today I can exclusively reveal to you that the field of dreams in question is home to Thurrock FC, now of the Blue Square South league. What makes the ground so different is that it started life as the gardens to the Thurrock Hotel and over time was adapted as a football ground. The Thurrock Hotel has stood on this site for many a year before the football club were founded in 1985, making its name as an almost halfway point between London and Saafend when the A13 was a major summer holiday route. Just a few miles to the west is the world famous Circus Tavern, which until recently used to the home to the PDC Darts World Championship. The club started in the Essex junior leagues called Purfleet FC and moved through the gears over the next years, gaining admittance to the Ryman’s Leagues in 1989. The ground was slowly expanded and new parts seemed to open every year, co-inciding with the regular friendly with West Ham United which used to swell the normal crowds of a hundred or so to over two and a half thousand (the record attendance still stands at 2,572 from such a game in 1998). The 2002/03 season was the pivotal moment in their history as it was the year the leagues were due to be restructured and so a top half finish in the Ryman’s Premier was essential. The club did not disappoint and they finished in 3rd place, thus securing a spot in the new Conference South. They also appeared in front of the TV cameras as they drew 1-1 at home to Luton Town in the FA Cup first round. 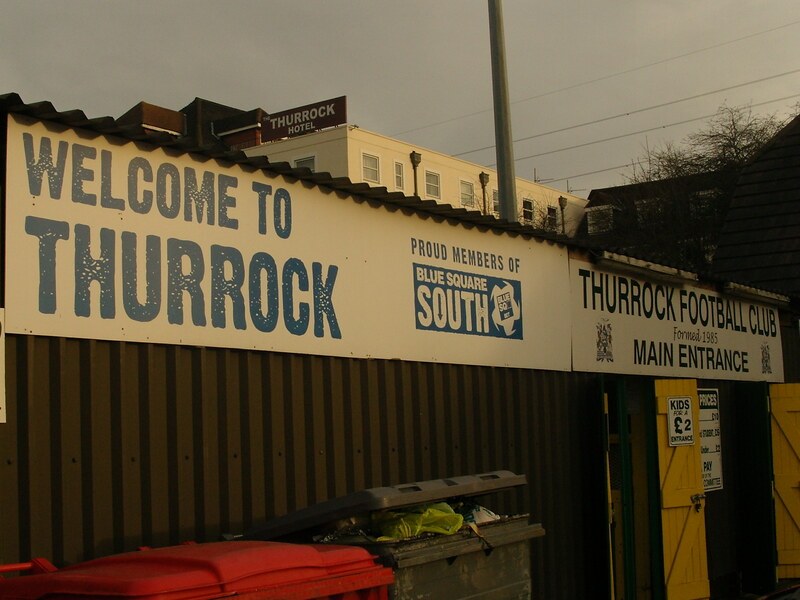 To build on the progress they had made on the pitch a decision was taken to rename the club Thurrock. Their first season at the new level was another major step in the right direction as despite having one of the smaller squads, grounds and average attendance in the league they finished in 3rd place and only lost out on Promotion in the end of season play off to Eastbourne Borough. The FA Cup cameras were back again for the visit of Oldham Athletic although this time they saw a 1-0 defeat. Since then they have continued to hold their own in this league. This season the focus has again been on trying to achieve a play off spot, and coming into the game against Lewes they had only lost two at home all season, although recent away form had been shaky including a 5-0 thumping in Wales against league leaders Newport County. The Fuller Family Christmas was winding down, and I had passed a late fitness test on my Swine Flu so I was ready to make the short hop across the Thames for this one. Joining me was of course Lolly, now complete with her official TBIR Press Pass (the joys of owning your own laminater), Northern Steve and Lincoln Liam (aka my brother in law and nephew). The remaining members of the Fuller Family Christmas ™ including of course CMF but also CMFOS (Current Mrs Fuller’s Older Sister) were not even out of sight or mind as they had gone shopping across the road (which is of course the M25). Dave and Deaks were of course coming, still in a daze at the 80 minutes of football they had seen on Boxing Day when Lewes had scored 6 against Dover. Alas, Danny was all Fiesta’d up (in a Spanish way and not a Readers Wives way I hasten to add) so we were due to Twitter him the latest. A little paragraph about the extended Fuller Family. My in-laws fall in two camps. Ones who are normal, and ones who aren’t. Fortunately our visitors were from the former – they enjoy a laugh, a beer and have a life. The latter ones don’t tend to visit – in fact my FIL (Father in Law) had developed an irrational fear of the M11 and A1 over the past few months and flatly refused to come down either as a driver or a passenger for Christmas. He is recycling obsessed, and his paranoia was summed up in a story from Christmas Day when he made everyone hand over their tags from their presents so he could shred them just in case someone put them in the wrong bin and it could be traced back to him. Yep – CMF is related to them but I don’t want any sort of prize for making her normal before you ask. I could fill a whole book with some of the stories from “up north” (hmmm, idea for a new project forming)…. Crowds do not exactly flock to Ship Lane. Taking away the five hundred for the game versus Dover, the average attendance is just over 230. This hotbed of football is a tough audience to crack as local rivalries between East Thurrock United and Averley still burn deep and travelling firms make some areas no go zones…..ok not strictly true but there must be a reason why the crowds simply dont turn up? It is not as if they cannot find the ground is it? And if they did win promotion, they would be one step off the Football League ladder meaning the likes of Luton, Oxford, Cambridge and York would be visiting regularly. Sure that is enough to fire up the emotions? No, I’ll get my coat. Traffic heading north to the Dartford Tunnel was piled back to past junction 4 when we joined it. Obvious everyone wanted a slice of this action on Bank Holiday Monday. It took us 30 minutes to travel five miles northwards, and by the time we made it on the over side of the Thames, West Ham had gone from holding their own away at Spurs to capitulating to another away defeat. No worries there though as Lewes would cheer our afternoon up – right? We parked up outside the turnstiles and paid a bargain £10 for Adults and £2 for the kids. I used the change from £30 to buy my programme inside the ground which immediately flipped open to an advert which said “Half price admission to season ticket holders of any Premier League club on production of your season ticket”. Really handy to know once you have paid to get in! Straight into the bar where Deaks and Dave were recovering from passing too close to some shops on the way here from the station. Dave had a little panic attack outside Curry’s apparently, thinking that this was what live had come to, and then another one when he found out that there were no bookies anywhere close to lay his bets on. 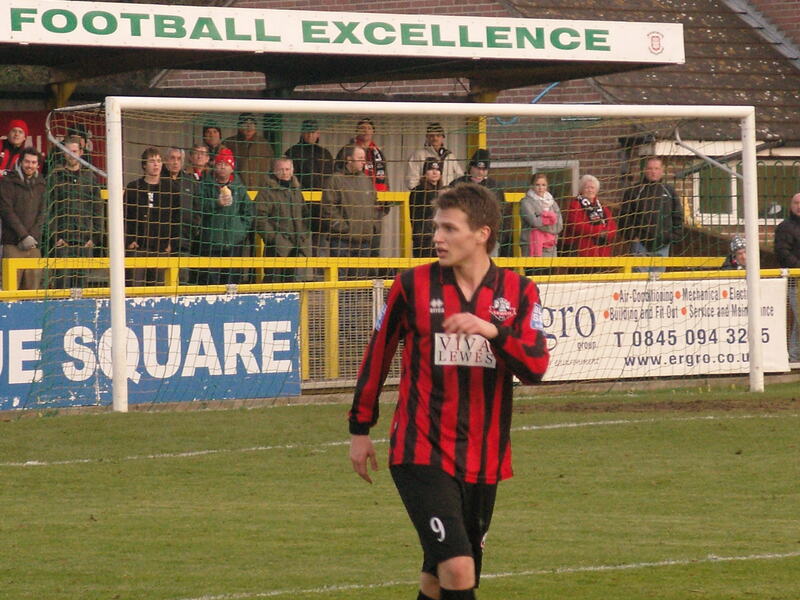 The bar was taken over by a sizeable Lewes away support, happy to put some cash behind the Thurrock bar. Sadly the Thurrock Hotel was closed for Christmas and thus those who fancied making a night of it next to the M25 were thwarted. We purchased our Golden Goal tickets and headed out onto the terrace. It is a strange ground, with the Hotel a looming shadow over the single tiny stand like a Essex Bates Motel. Behind the goal was the dressing rooms, caged in to stop fans committing the heinous crime of walking in front of it. After Thurrock’s David Bryant had collected his award for “Player with the most similar name to the only bowls player known to the general public”, the game kicked off as the temperature started to fall. The first half was an open affair, made more interesting by the play acting of the biggest man on the pitch, Thurrock’s Robert Swaine who fell down on a couple of occasions. On the last one he received lengthy treatment, accompanied by a single man rant, aka Cynical Dave, which went along the lines of “Cheat, Cheat, Cheat…” for a full 3 minutes. Impressive stuff. After a half time refuelling stop we emerged back on the terrace in time to see Thurrock take the lead. 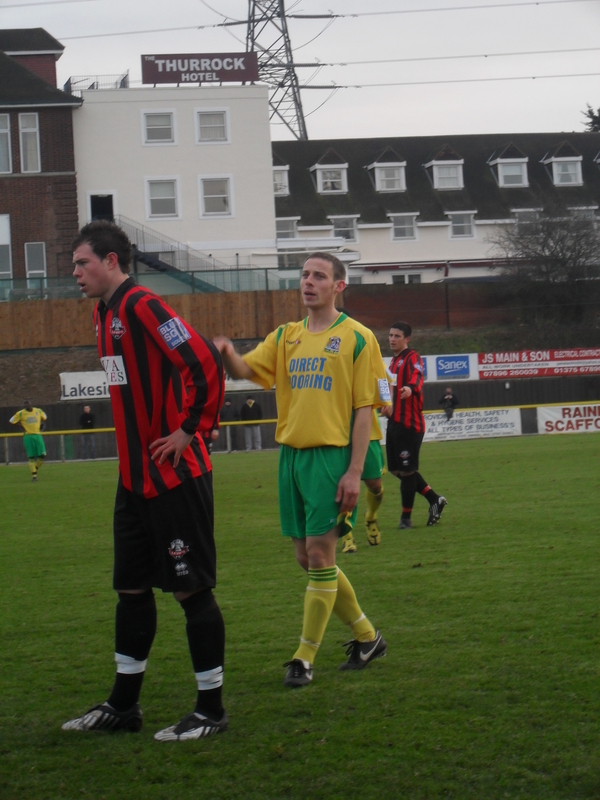 A great run down the line by Lalite was met by the unmarked Matt Bodkin and it was 1-0. I nervously opened my golden goal ticket – 52 minutes. My stopwatch, as used by Sir Alex Ferguson showed 51 minutes 53 seconds – aka the 52nd minute! I was a winner, or so I thought. A stewards enquiry was called and from somewhere 10 seconds had been added to the half and I had lost out on the pot of gold as 53 minutes was the official time – boo, hiss… Northern Steve was dispatched around the pitch to find some good old fashion northern food but returned with a huge hunk of french bread with a hot dog sausage stuffed in the middle and NO GRAVY! He was distraught at the level of catering in Essex and vowed never to return. I got so excited by the fayre that I missed Lewes’s equaliser. 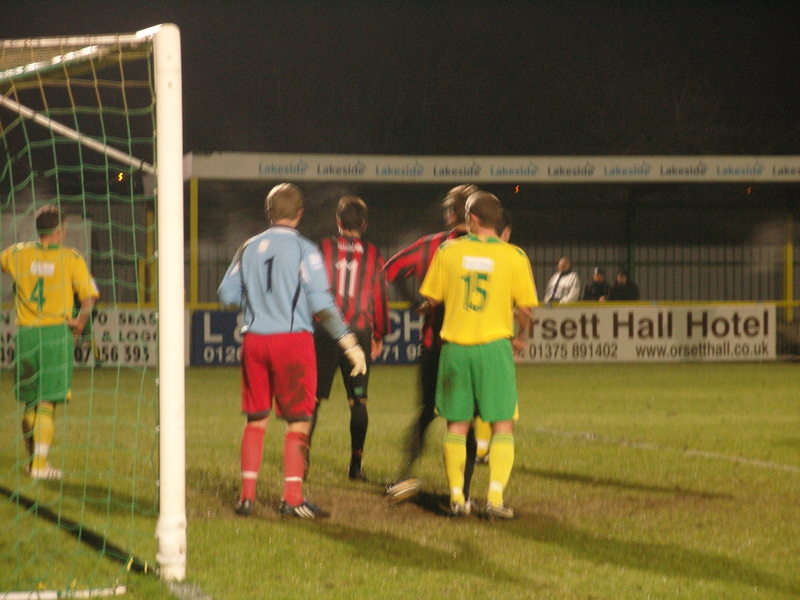 Two minutes after going behind Jack Walder had turned and slotted home from the edge of the box. Goal of the game came a few minutes later though. A long cross pitch pass caught out the Lewes full back and Bodkin ran onto the ball at full speed and delivered an inch perfect cross for Leon McKenzie to smash the ball home – a goal worthy of any stage. Lewes huffed and puffed but there was only going to be one winner and a third goal a minute from time, again on the counter attack put an unfair reflection on the final score but McKenzie again took the goal very well. On the final whistle the two hundred and seventy headed off their separate ways. Dave and Deaks into the twinkling lights of Lakeside and us into the car and back into the safety of The Garden of England. Roll on Dover on Friday.